The Hopper Mound Site (23BO1) was excavated by archaeologists from the University of Missouri at Columbia including Jesse Wrench, Brewton Barry, and J. C. Harrington. The results were published by Harrington in the Missouri Archaeologist 4(1). The fieldwork was conducted in 1935. Colorized top plan showing the vault walls and interior space. Colorized profile showing the stone vault. 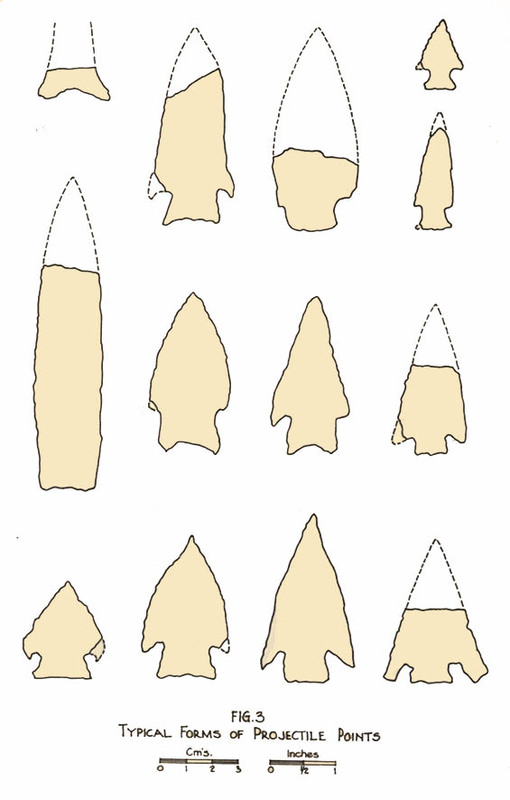 Outline drawings of artifacts from the Hopper Mound 1 (23BO5) published in Harrington (1938). The artifacts and architecture of the mound indicate that it was definitely used during the Late Woodland Period; its origins may extend as far back as the Late Archaic based upon some of the discoveries. 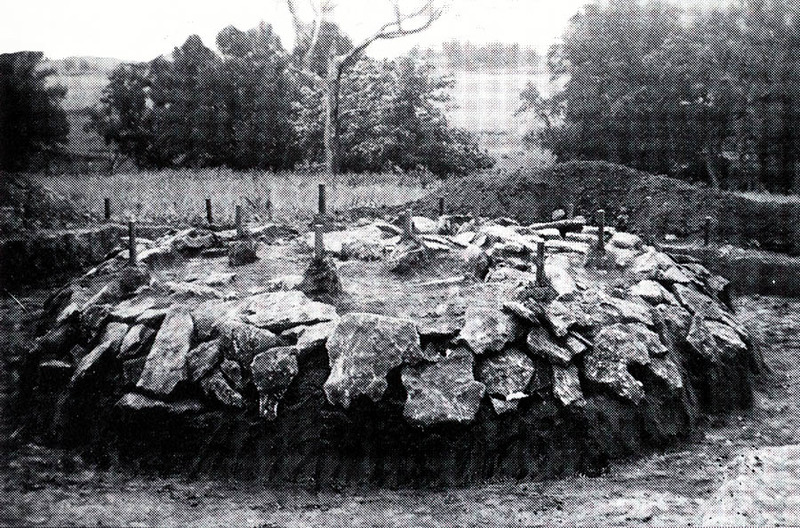 The circular shaped mound measured 45 ft in diameter and 2 ft in height. The original height of the mound may have been at least 3 or 4 feet before cultivation and the diameter may have been smaller. It was disturbed by looters before 1910 and significantly damaged by intensive cultivation that began around 1925. A stone vault, situated in the center of the mound had been constructed from local limestone slabs. Only wall remained intact within the vault because of the destructive excavation methods of the looters. It is safe to assume that the interior vault space was small measuring approximately 7 x 8.5 feet. Two infant burials and remains of an adult burial were still preserved in a small, undisturbed portion of the vault floor. 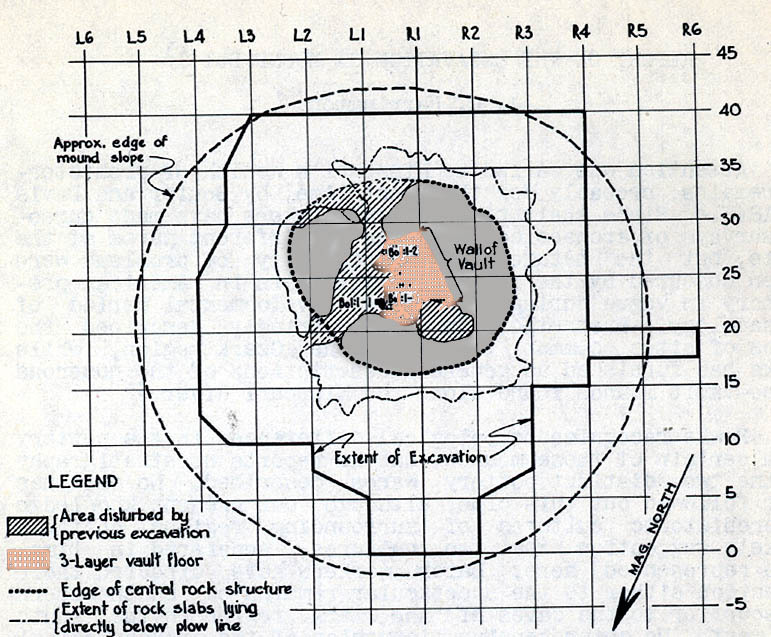 Limestone slabs forming the vault of the Hopper Mound (23BO1) published by Chapman (1980:114). Digital scans of black-and-white photographs from Hopper Mound (23BO1) published by Harrington (1938). Left, mound cleared and axis staked out. Right, mound partially staked out and sod removed. Digital scans of black-and-white photographs from Hopper Mound (23BO1) published by Harrington (1938). Left, 10 foot profile. Note valley of Bonne Femme Creek in distance. Right, 15 foot profile showing scattered slabs near the surface of the mound. Digital scans of black-and-white photographs from Hopper Mound (23BO1) published by Harrington (1938). Left, Excavation extended entirely around central rock structure exposing it on all sides. Right, central wall structure showing the one remaining wall of burial vault. Note 6-inch layer of dark earth beneath rocks. 1938 Report on the excavation of Mound BO1:1. Missouri Archaeologist volume 4, number 1.